Location tracking is enabled by default on Windows 10 and it provides accurate results for maps and web. However, if you do not like the idea of tracking the location, you can easily turn it off from Windows 10 settings. You can disable it for the entire system or just for specific apps. Also, all your tracking information is saved in a database that also occupies considerable space. Hence it is possible to create some extra space on your system by deleting this information. In this tutorial, we will educate you on how you can turn location tracking on/off and clear location history in Windows 10. 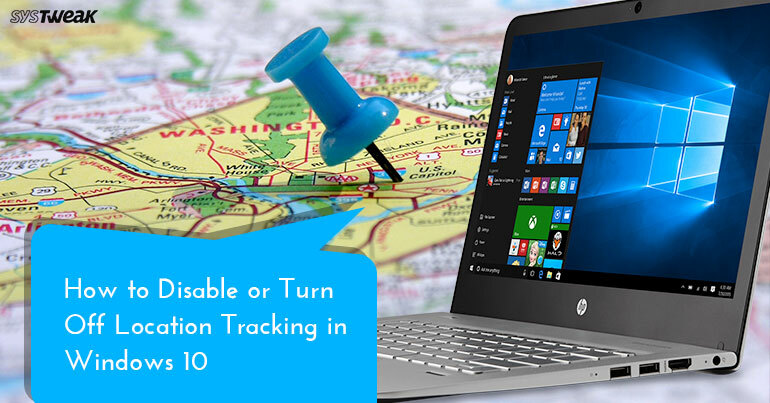 Why should you disable the location tracking in Windows 10? As we know that if the location tracking is enabled than Windows 10 can track the websites you visit, the places travel, and all other online activities. If you are concerned about privacy, then you can easily turn Location Tracking off on Windows 10. Click on the Start button and then click on Settings represented by a gear icon. From the Settings window, click on the Privacy. In the next window, click on the Location tab from the left panel and then click on the Change button. Once you will click on change a pop-up will appear, toggle OFF the switch for Location for this device. Using these below steps, you can control the location tracking for each app individually, in case you do not wish to disable location tracking completely. Next, click on Location tab from the left panel and then scroll down to bottom and switch OFF the Location Services for the specific apps. In the screenshot below, location tracking is already disabled for Camera and if we want to disable it for Maps too, we can simply toggle off the button next to it. Click on Location tab from the left panel and then scroll down to bottom and click on the Clear option located under Location history. Location tracking is a Windows 10 feature which is enabled by default. However, not all the users wants to monitor their activity continuously. So, if you are a user who is concerned about their privacy then you should follow the article to make sure that you’re not being traced without your knowledge.